As well as being environment-friendly and economical for home and commercial purposes, photovoltaic solar energy has a lot of applications for farms everywhere. The US Department of Agriculture tells us that 36,331 farms use solar energy, making it by far the most common type of renewable energy technology for farming in this country. (Other stats place the number closer to 90%.) In Europe, production of renewable energy from agriculture increased almost sevenfold over only six years recently. Though California uses more renewable energy systems in agriculture than any other US state, the technology is up and running in Ohio, too. You may not be aware how Ohio farms currently use PV solar. One farmer uses his new system to decrease grain drying costs. Another has invested in on-farm solar to offset some of the electricity needs at a swine finishing facility. Five years ago, there were 115 installations in the state, and the numbers have been growing swiftly as the word gets out about new advances in solar technology and financial incentive programs. Tech improvements and market development have cut the price of on-farm solar systems for farmers in Ohio by more than half. Some basic information about prices: a Department of Energy Sun Shot Report points out that the average installed PV solar price for a midsize system (10 kW to 100 kW) has dropped by 6-7% annually since 2000. Average installed cost then: $10 per watt; 2012, $4.62 per watt. Eric Romich, a field specialist in energy development and leader of OSU Extension’s Energize Ohio signature program, thinks solar offers important benefits to ag operations. Romich and his Energize Ohio program have put together some amazing resources for both food and livestock farm solar systems in Ohio. They show step-by-step how solar energy can benefit farm operations and the nitty-gritty of farm solar costs. You may be interested in their video series on renewable projects and energy efficiency. One especially useful program (video below) gives an overview of Ohio’s renewable energy policy, net metering, solar PV technology, on-farm solar applications, and a review of Ohio examples. The team has also recently designed and built a Mobile Solar Unit with a 140-watt PV solar panel, charge controller, battery back-up system, 2000-watt inverter, and safety disconnects. Very useful for remote outdoor events, field days, county fairs, and 4-H camp demonstrations, and it offers attendees a ready-made charging station for cell phones and laptops! It fits in the back of a pickup truck and needs only a projector, TV, computer, or microphone. To reserve the Mobile Solar Unit for an event, fill out the application form here. 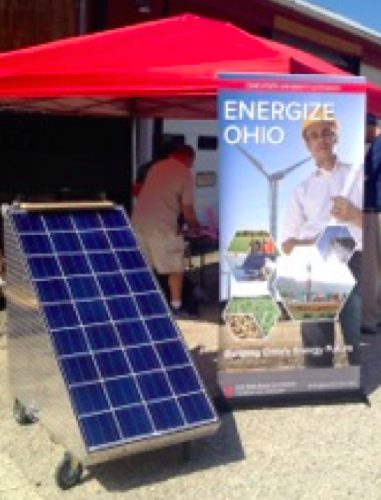 When greater interest in solar energy picked up with Ohio farmers earlier this year, the OSU extension, government agencies, and industry responded with some educational programs tailored specifically toward farm use. Van Wert/Paulding held an Agronomy Day in February, and Huron County provided a workshop in April. Some of the participants are already putting together farm solar energy systems on their properties. Most on-farm systems in the state are connected to the existing power grid. Fortunately, Ohio has net-metering policies that allow all utility consumers to generate their own electricity and then offset a portion of what they buy from the grid. Off-grid solar systems, increasing in popularity, may also be useful to the state’s farming community, especially to people in remote locations without access to standard power options. Romich says he sees a great demand from farmers to improve their operations with this renewable technology. For additional details on On-Farm Solar Development, visit go.osu.edu/farmenergy. If you have specific interest in installing an on-farm solar energy system in Ohio, or have friends or associates who do, contact Eric directly at romich.2@osu.edu, 419-310-8147. The USDA’s Rural Energy for America Program (REAP) is available to farmers as well. It offers both loan guarantees and grants and provides a 30% tax credit on the cost of the project. This can mean you’re able to recover the cost of a complete system in as few as four years, with payback starting within five to seven. Contact the program here for eligibility requirements, technology details, and financing information. Solar Energy Applications for Farms and Ranches from USDOE. Office of Energy Efficiency and Renewable Energy. Discusses the use of space and water heating for farm buildings, greenhouse heating, electricity for farm and ranch equipment and crop and grain drying. Clean Energy, from Union of Concerned Scientists. Information about renewable energy and agriculture including fact sheets: Renewable Energy and Agriculture: A Natural Fit and Clean Energy Blueprint Benefits Farmers and Rural Economies. What Alternative Energy Options are Available for Farms? from USDA. NAL. Alternative Farming Systems Information Center. Provides an overview of information sources for alternative energy options for farms available from the United States Department of Energy. Energy Conservation and Renewable Energy, from USDA. Sustainable Agriculture Research and Education. Presents information about the relationship of sustainable agriculture to renewable energy including the symposium, Renewable Energy and Sustainable Agriculture: Exploring the Crossroads. Farm Energy Alternatives, from National Center for Appropriate Technology. ATTRA – National Sustainable Agriculture Information Service. Includes sections on renewable energy and energy efficiency with publications. A Directory of Energy Alternatives lists companies and organizations providing renewable energy services. Database of State Incentives for Renewable Energy, from Interstate Renewable Energy Council. Provides a map-based interface for information about state, local, utility company and selected federal incentives that promote renewable energy. Join the US rooftop solar revolution!